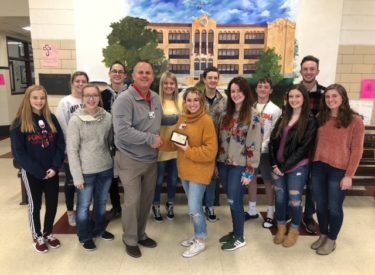 The Po-Hi Student Council recently presented their Gold Chapter award to high school Principal Thad Dilbeck. Gold Chapter awards are given by the Oklahoma Association of Student Councils to chapters that are active on the local, district and state level. The Po-Hi Student Council has received this award every year since 1995. Ms. Betsy Easley serves as the Student Council Advisor. Pictured are Student Council members, front row, Autumn Leist, Hattie Steichen, Principal Dilbeck, Morgan Didlake, Jamie Doornbos, Shae Burden, Lanie Varner. Back row. Madisyn Greene, Tate Burdick, Addie Dilbeck, Grant Jackson, Nate Harbeson, and Kale Gilbert.